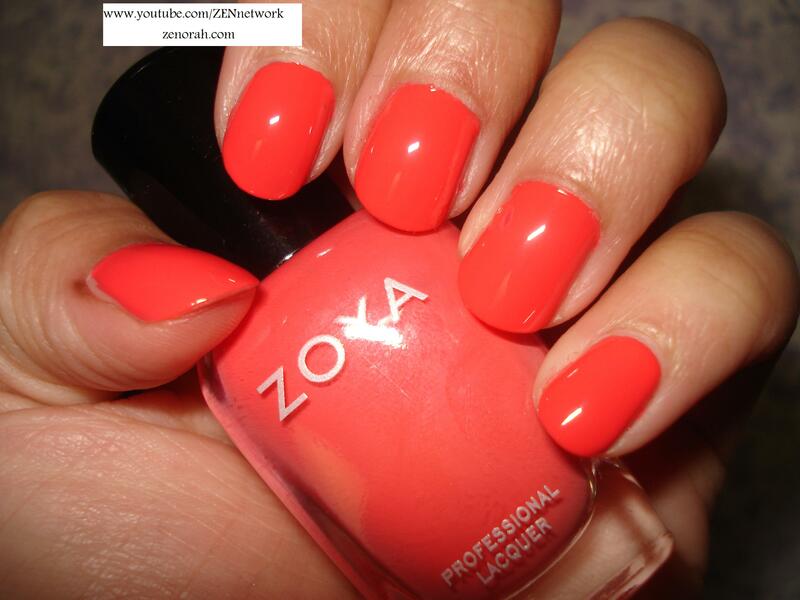 Zoya Elodie – is a bright coral pink creme polish. My camera was freaking out when I tried to take pictures of this polish – it looks more neon in the picture than it is on the nail – but it is essentially a true pink toned coral polish. I believe this was released in Zoya’s Gossip Girl or Hills Collection in 2009 – and such a beautiful shade of coral. While I rock the craziness of this on my fingernails, I think it’s better as a pedicure colour – usually I wear it on my nails as a form of an accessory (yes, I view my nails as a ‘form’ of jewelry – you don’t? lol – you should!) to add a pop of colour. Typically I reach for this baby in the summer months only and it looks super HOT with a tan, while it does not enhance a tan, it does COMPLIMENT it and if you are one to stay clear from the neons then this would be a very excellent choice in wanting a bright shade without the blindness of a neon polish. I think I am bias to this colour because it reminds me of the colour of the hibiscus flowers in the garden of my childhood home on the islands. While I am all about the colour and trust me – I do LOVE it – here in lies the problem, it is a little watery in formula, which is different from their signature buttery texture creme polishes. It does dry quickly and needed 3 coats to be fully opaque. When it comes to Zoya polishes, it’s not the typical colour they usually release which is why this one is special. In addition, I think of it as an unsung hero – its a gorgeous shade of coral and one that you may walk by a couple of times and never notice it but that being said – I am certain you can find a dupe of it – if memory serves me right, I think Rimmel London has a colour kind of similar to it called Coral “something”. Do you own Zoya Elodie? What are your thoughts on this nail polish?